Travertine pavers and travertine tile can be found in the Houston area and are becoming the paver and tile of choice as consumers look at the options. Travertine pavers are 3 times stronger than concrete pavers. So they provide the perfect solution for pool decking, patios, sidewalks and driveways. Travertine pavers and travertine tile also get less slippery when water is applied to them. A certain suction builds up that allows them to be used for a pool decking surface. Travertine pavers and travertine tile also stay about 30-40 degrees cooler than the typical paver or tile. This allows you to have a much lower potential for burning your feet on their surface. The Houston heat will get strong during the Summer months. So the travertine pavers and travertine tile are an ideal solution for the Houston area. As you look around Houston, you will begin to see more and more travertine pavers and travertine tile showing up in high end type pools. 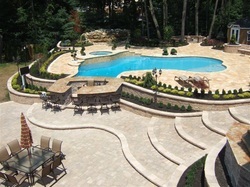 As you can see in the photo to the left, travertine pavers and travertine tile can change the makeup of your backyard. The travertine pavers can be placed on top of concrete or sand. Many people ask, "Should I place my travertine pavers on sand or concrete?" The answer is that the natural stone can be place on both surfaces. A typical remodel includes an extension of the deck. If the deck is already in concrete, some will choose to extend out by adding more concrete. But you can also just add the travertine pavers or travertine tile on top of the concrete portion and then extend out the rest of the deck on top of sand. This will cause you to save money on placing in concrete. 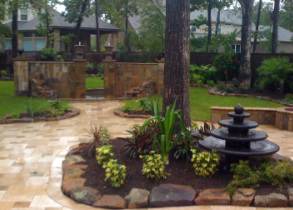 You can see some Houston Travertine Pavers photos by hitting the link at the top of the page. How Durable are Travertine Pavers? Travertine pavers are more durable than concrete. In fact, travertine pavers are 3 times as durable as concrete. Travertine pavers can be installed as a driveway surface. You can drive your car or truck over travertine pavers. I remember the first time I watched a large truck drive over travertine pavers. I was impressed with their strength. Travertine pavers are typically only an inch and a quarter thick. So watching a truck drive over a paver that is only an inch and a quarter thick surprised me. I then learned the reason why early civilizations used the travertine pavers. I also figured out why those same travertine pavers endured thousands of years even to today long after empires fell. 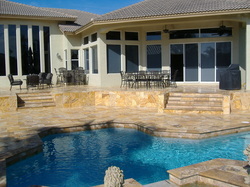 Travertine pavers and travertine tile are strong and durable. Long after your house has come and gone, the travertine pavers will endure. The tough surface will serve well in the extreme weather conditions including the Houston heat. Monday to Friday: 7:30 a.m. to 4:00 p.m.
Saturday 8:30 a.m. to 1:00 p.m.